This differential pressure transmitter in a control panel housing is suitable for use as a 2- or 3-point controller thanks to its two integrated limit contacts. These permit the realisation, e.g. of ventilation controls, at low cost and without the need for additional electronics. Both the threshold values and the hysteresis for the controller are easy to set via the front keyboard. 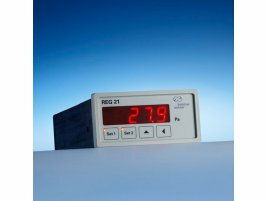 The display provides readings of measurement values directly on-site in Pa, kPa, inchH2O or mmH2O as well as information about the output states of the limit contacts. An adjustable time constant (up to 10 s) allows the instrument to generate an attenuated output signal, even under fluctuating pressure conditions. Cyclical self-calibration of the zero point ensures a high level of measurement accuracy. The instrument is available with an ISO factory calibration or DAkkS calibration certificate (optional).